Ethiopian athletes Gelete Burka (women’s race) and Abrha Milaw (men’s race) won the 43rd edition of the Paris Marathon on Sunday. Milaw won the men’s race with a time of 2 hours :07 minutes and :50 seconds. Burka was the fastest woman with 2 hours :22 minutes and :48 seconds. 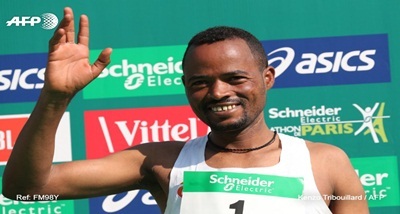 Kenyan Paul Lonyangata, a two-time Paris Marathon winner, was the third-fastest man today. In the wheelchair race, Julien Casoli won for a third time. The fastest disabled racer put up a time of 1 hour:36 minutes and :57 seconds. The Paris marathon is one of the world's most popular running events.